A marketing automation message is a special type of a message used only as an action in marketing automation workflows. The main difference to other messages you can use in GetResponse is that you don’t set the sending properties. 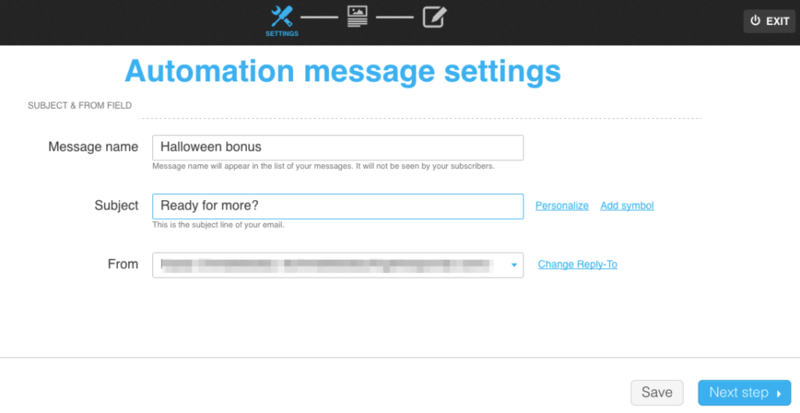 The message gets sent as a result of all conditions and filtering that you set up in the workflow. The marketing automation message can be a copy of an existing message layout (newsletter, autoresponder, A/B test message, or draft). It’s created automatically the minute you choose your source message type to be sent as an action in your marketing automation workflow. The marketing automation message is an exact copy of your source message type selected in properties – all original images, text, and hyperlinks are being carried over. However, the original settings regarding the sending of the message don’t work. Instead, we use the settings of the marketing automation workflow where you use the message. For example, if you use an autoresponder for the type of message, the template is copied as a marketing automation message, however, the original autoresponder settings stop working. When you choose an A/B test type of message, the marketing automation workflow doesn’t continue with running the tests, it will simply use the template that you’ve chosen. For the time being, if you want to do a multivariate testing, you need to use the standard procedure. For more information, see our A/B testing section. Where do I find statistics for my automation messages? Messages sent as a part of your marketing automation workflow have their own statistics that can be found on Manage automation messages page. You can access this page by selecting Manage messages from the main Automation menu, or you can take this shortcut, https://app.getresponse.com/automation_manage_messages.html. The statistics for the messages that you used as an automation message template stay intact. How do I edit my automation messages? Go to Automation>>Manage automation messages and find the message you’d like to edit. 2. Expand the Actions menu next to the message and select Edit to open the editor. 3. Edit your message settings and the From field. When you’re done, click Next step. 4. Edit your message just like you edit a newsletter template. When you’re done, click Next step. This saves your changes and takes you back to Manage automation messages. Note: You can also edit your automation message drafts. Go to Automation>>Manage automation messages and select Drafts. Then, follow the above steps to edit the settings and template.